Raccoon uncle Edward Mulberry is really good at making toys and mending broken ones. 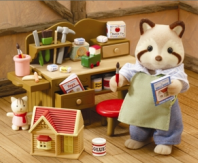 He has a wonderful workbench with lots of useful tools, paints and books about toys. Everyone brings their teasured toys to him if they have a problem. There are also some toys in this set that he's working on, including a miniature house for his nieces Candy and Pumpkin for Christmas! Includes raccon uncle Edward Mulberry.